A free compassionate listening service is offered to members of military families living without a loved one. The Stephen Ministries is a non-denominational ministry that provides a one-on-one confidential listening ministry. Since starting in 1975, more than 9,000 congregations from over 100 denominations are involved in Stephen Ministry. These congregations come from all 50 states in the U.S.A, 9 Canadian provinces and 21 other countries. Stephen Ministers care for people who are suffering some difficulty or trauma in their lives. Stephen Ministers don't give advice and they don't proselytize. If the person receiving care wishes, the Stephen Minister may say a prayer during the session for them but that is totally optional. 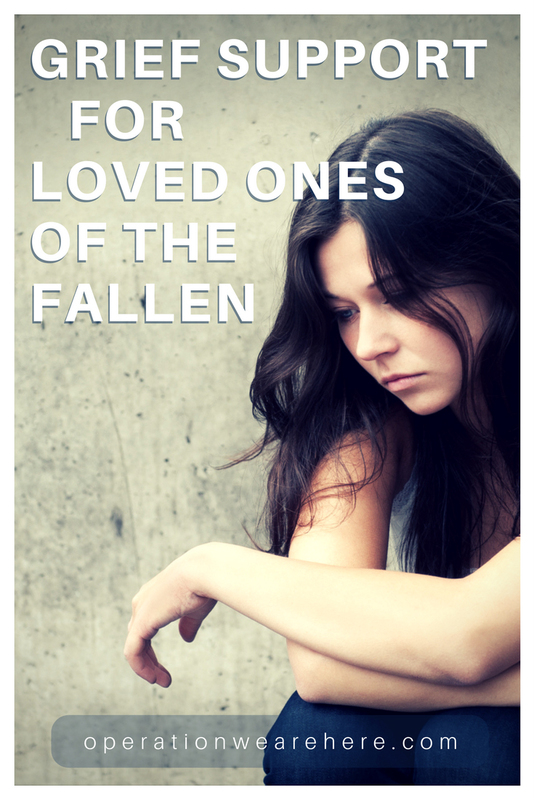 The caring listening is being offered to spouses, parents, adult children and siblings of those who died or those who are dealing with separation due to military service. Please pass this information along to others who would benefit from the caring listener. Free mental health services to U.S. military personnel and their families affected by the current conflicts in Iraq and Afghanistan. Got Your Back Network answers the needs of military families and brings them comfort in a variety of ways. Our work can take us down the street or across the country. No matter where the family lives or where the answer to their need is located, Got Your Back Network works to connect the two. Got Your Back Network is also looking to partner with professionals nationwide who can assist in providing services for the families of our fallen heroes, to include grief counseling. Free counseling for first responders and family members of fallen soldiers, police officers, firefighters, and emergency medical technicians. Military OneSource offers three kinds of short-term, non-medical counseling options to active-duty, Guard, and Reserve members and their families. Military OneSource counseling services are designed to provide service help with short-term issues such as adjustment to situational stressors, stress management, decision making, communication, grief, blended-family issues, and parenting-skills issues. Individual grief counseling is a one-to-one resource that is important to many in their grief journey. The opportunity to sit with a skilled therapist who understands grief and trauma can help the survivor gain the necessary skills to integrate the loss into their lives. This can empower survivors to find strengths within themselves that they may not have realized were there. TAPS makes every effort to connect survivors to no-cost services. We partner with the Veteran's Administration, which maintains more than 250 counseling centers known as Vet Centers. For those that do not qualify for grief counseling through the VA, or for whom the VA is not the best fit, we utilize organizations such as Give an Hour, Psychology Today, Open to Hope, and TAPS volunteers licensed in mental health treatment to ensure the counseling needs of survivors are met. The Michael Strange Foundation will provide unconditional support and services to the families of recently fallen service members by professionals in several fields and also by those who have suffered similar losses so that the healing process can begin. We are a group of licensed mental health professionals who offer free psychological treatment to military service members (active duty, National Guard, Reserves and veterans) who have served or who expect to serve in the conflicts in Iraq or Afghanistan. We also provide treatment to members of their families and other loved ones. Treatment is conducted in our private offices. Our therapists are all volunteers and our services are entirely confidential. We do not report to any governmental agency. Grief Support Network is a free proximity-based social network connecting & supporting people grieving or who have grieved with the objective of creating a global community of Grief Angels that can be there for each other during one of live's most difficult time. Getting through the holidays can be difficult when you are dealing with the death of a loved one. Helpful tips and articles. TAPS offers a wonderful network of trained professionals who are on call 24 hours a day, seven days a week. We understand that grief doesn’t follow a normal ‘business day’ schedule and we will answer your call anytime for help or information and spend as much time as necessary to help you. Whether during the day or at night, when grief can make for sleepless nights, you can call us at 1-800-959-8277. We are here for you!